Home / Fashion / Kendall & Kylie’s Game Review: THE KWEENS! Kendall & Kylie’s Game Review: THE KWEENS! Because we’re gamer girls and because we’re guilty of playing almost all of Glu games of which just some are Stardom: Hollywood (the original game that Kim Kardashian’s was based off of), Zombie’s Ate My Friends, of course Kiki’s game: KARDASHIAN. So it was ONLY natural for us to be curious about the game Kendall & Kylie released just a few days ago. We thought it would be great to do a review on the app! One of the first noticeable differences between K&K’s game from Kim’s is that it is in portrait mode, rather than landscape. The second most immediate difference spotted is the choice of physical characteristics of your character and body proportions. If we’re honest, it’s taken a few days to get used to. It’s honestly quite hard to achieve a very pretty look with the free options available. Dare we say it, we did spend a little REAL money to achieve the look that satisfied! Eek! The way we like to see it is, we’re just grown up girls playing “virtual Barbie” essentially. And “Barbie” needs to look good! 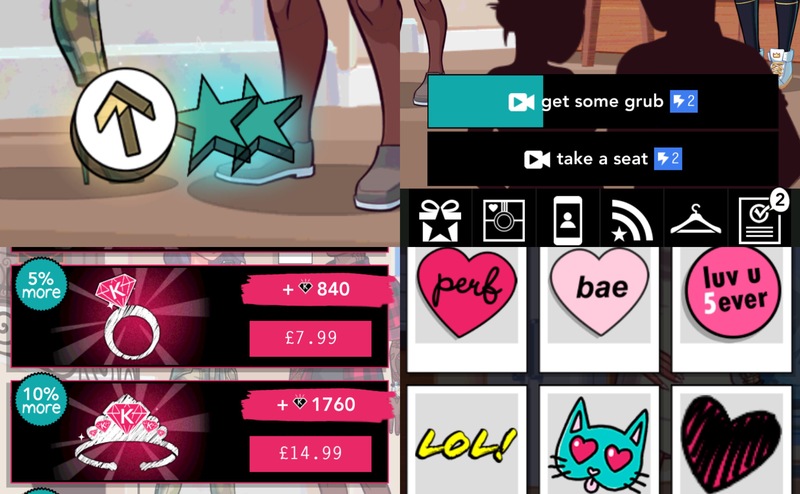 Kendall and Kylie’s game addresses some desires players wanted from Kim’s game like the ability to wear flat shoes as well as heels. What they’ve done differently, and dare we say this definitely feels more of a Kylie contribution, than Kendall, is the different nail shapes you can have for your character. You can have a short natural manicure, an oval medium-long manicure or a stiletto long manicure. For the latter two, you’ve got to dish out the K Gems. And you’re most probably going to need to part with some real money. This was something we bought with the £3.99 we spent to get 400 K Gems. Everything about the game is very “age appropriate” to Kendall & Kylie. It’s young, fresh, fun and vibrant. From the hairstyles and hair colours to the actual storyline and progression. It’s genuinely a nice spin to Kim’s game. Though there are similarities in how the game is played to Kiki’s, it stands well on it’s own. The music in the background is nice and thankfully different to Kim’s game. However there’s one soundtrack that is a little harsh on the ears and our LEAST favourite! Unfortunately it plays a little too often in the game! It would be amazing if we got to choose which soundtrack we wanted to play in the background. That’s something that’s not possible in either Kim’s or Kendall & Kylie’s game. One of the best things was the “Kross Over” between the two games! If you played up to Level 7 on the KARDASHIAN game, you were gifted a free outfit in BOTH games! From a new hairstyle, outfit and shoes! Luckily, we’re on Level 29 on Kim’s game, so we got them straight away! Now that we’ve given a description on the character customization options and the graphics in the game, it’s time to move on to the storyline progression. It starts off with you, a new girl (or guy in town) and you’re guided in the game play. Swipe left or right to move the screen. Because the game is in portrait mode, there’s less to see all at once. It does make for an “on the go game” though because you’re not swiveling your device back and forth from the game to other apps on your phone. 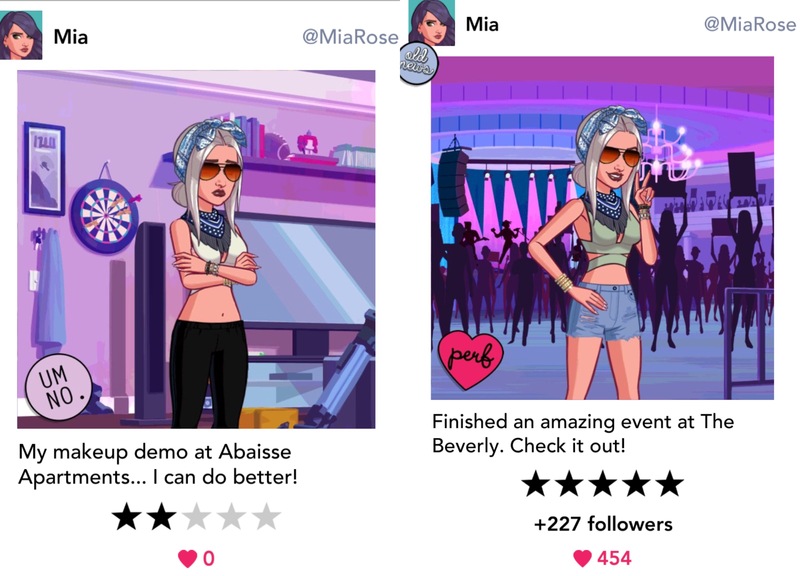 The other interesting part of the game is becoming a Social Media star through Vlogging beauty and hair tutorials and vlogging events that Kendall & Kylie are at. You get to meet some friends of the girls in the game as well who later become your business contacts like MC Brizzy. The better you do in the “gigs” set up by your “friendeger” Perry Young (new word we just created), the more followers you get! You even “trend” the better you’ve done in that gig. Like Kim’s game, there is an arch nemesis in this game. Kiki’s game has us constantly harassed by one Willow Pape, and in Kendall & Kylie’s we’ve got Aubrey Maddison. She’s also our friendeger’s on-again-off-again girlfriend! Yikes! Perry is introduced to us by Emily Sun who works at the salon we’ve started to work to make ends meet. She’s a super fun girl who makes vlogs in her spare time at the salon. We help her out and that’s how we get to meet Perry, who ends up helping set us up with “gigs”. We won’t go into too much detail because we don’t want to spoil the game play and storyline progression for you guys and girls who want to play the game! So far we’ve come across 30 minute to 1 hour long dates, and 3 hour or 8 hour long gigs. This is where our complaints come in. It takes an annoyingly long time for the energy bar to go back to 23 (it varies on according to what level you’re on). It genuinely takes longer for the energy bar to fill up as opposed to Kim’s game. And it takes more lightning bolts to get through an 8 hour gig than it does on Kim’s. This is the most frustrating part because it means you need to pay real money if you want the game play to go slightly faster. It’s a good move on their part as business owners, but so painful for us! If you get 2 or 3 stars in a gig, you lose some followers. If you get 5 Stars, you gain alot of “hearts” on your post for the gig as well as gain quite a lot of followers. But, it does take a lot of dedication to achieve 5 stars in gigs because of the amount of time it takes to refill the energy bar! Needless to say, we quench our clicking thirsts when this happens and play back and forth between the KARDASHIAN game and Kendall & Kylie’s. Oh and MAYBE we slip in some work in between, but honestly, who wants to work?! We’re becoming social media KWEENS!! Hello! Overall the game has proven to be fun and entertaining. If you want to know how to become a social media KWEEN, play Kendall & Kylie’s game and you might just learn how! We give this game 4.5 stars for now! We’re only on Level 9, but we’ve played enough of the game to love alot of aspects and voice certain things we’re not so in love with. If they improve on the energy recovery time, provide some nicer hairstyles that are possible to purchase with money “in-game” money rather than 299, 399, 499 or 999 K Gems, would be amazing! Even providing nicer eye shapes would be great! It also seems to us that the game has a heavier influence of Kylie in it. It would be great to see more of Kendall’s influence in certain aspects. Maybe allow us to go for two different storylines – do we want to be Social Media KINGS (Kylie), of High Fashion KWEENS (Kendall)! If they can reflect and improve on these aspects, the game will be golden. We’re curious to see where the journey takes us and just how famous do we get in Kendall & Kylie’s game! Right now, we’re off to finish our gig that’s going to help us reach 5000 followers! We wanted to include an edit to this post, now that we've had even more time to play the game. And the edit isn't lacking frustration. There is definitely a lot more thought that needs to go in the game. Something we feel Kim definitely put and continues to include in her game. 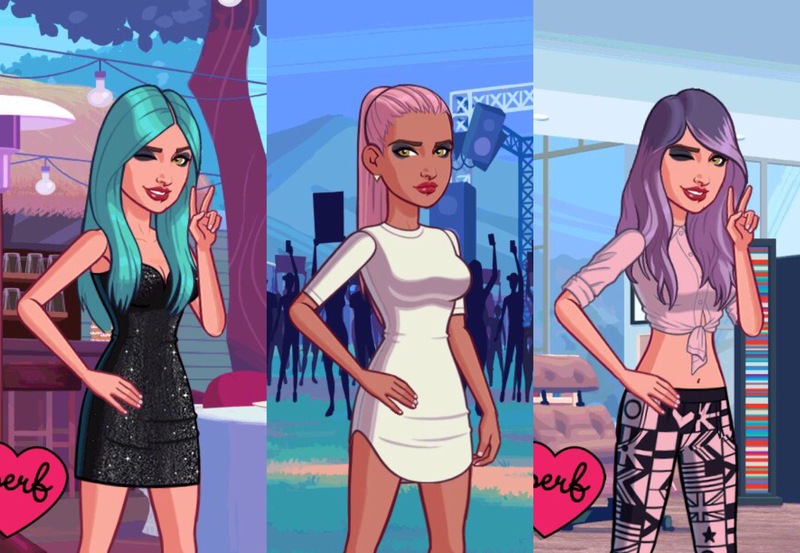 Kendall & Kylie's game lacks a good selection of clothing that is actually achievable! Any of the nice outfits, jewellery, shoes or hairstyles are all to be bought with K Gems! Not even a decent amount of clothes that can be bought with regular money earned by gigs! Any trousers or tops you CAN buy are the same design; just in different colours. Seriously, it is NOT FUN! They still haven't updated the amount of excruciating time it takes for energy to maximize. We've found that we've not rushed back to play this game for the gigs as we have definitely done for Kim's game. Another irritating aspect is Perry constantly contacting us for other gigs when we're still completing one. That's beyond annoying! There's also no way to earn energy by clicking on things in a certain location, because all you get are $$ and an arrow. Not to mention the ridiculous amount it costs to travel abroad in the game. It's clear Kendall & Kylie are only looking to earn a lot of money through the game, without keeping in mind that there is such a thing as customer retention! And that can be achieved by providing players with a nice selection of items they can purchase from their earnings in the game! WITHOUT USING REAL MONEY FOR K GEMS! They introduced PacSun in the game with a very modest selection of outfits. But, AGAIN. They cost K Gems! And LOTS OF THEM! What's even more insane is that the amount of K Gems everything costs, is extremely high! We've spent real money in Kim's game, but we've been able to purchase a nice amount of hairstyles and clothes from the K Stars we bought! This is NOT achievable in Kendall & Kylie's game! 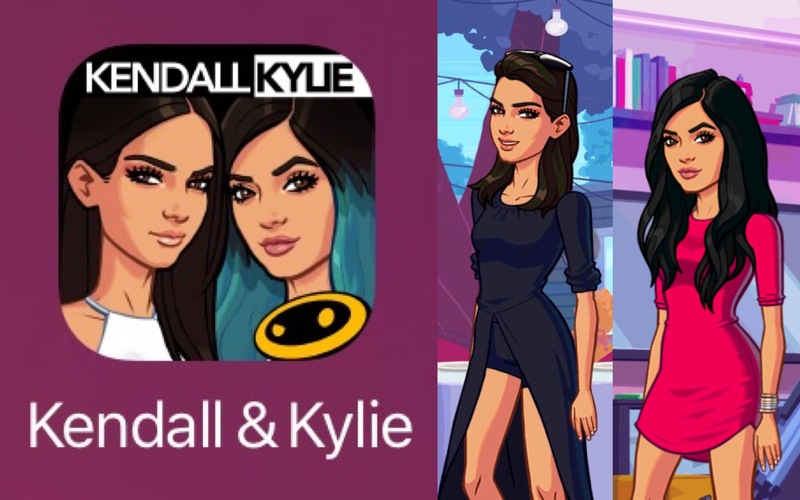 There's definitely a long way to go for Kendall & Kylie's game. A lot more improvements need to be made, with REGULAR updates, before it can even attempt to come close to Kim's game. They need to listen to customer feedback. And until now, it's obvious they aren't. We're not happy campers! Lets hope the next edit we do, if we do it, is more positive! Amazing blog!!! !.Its awesome and unique. The way its presented revived my childhood memories. !!! Beautiful !! !